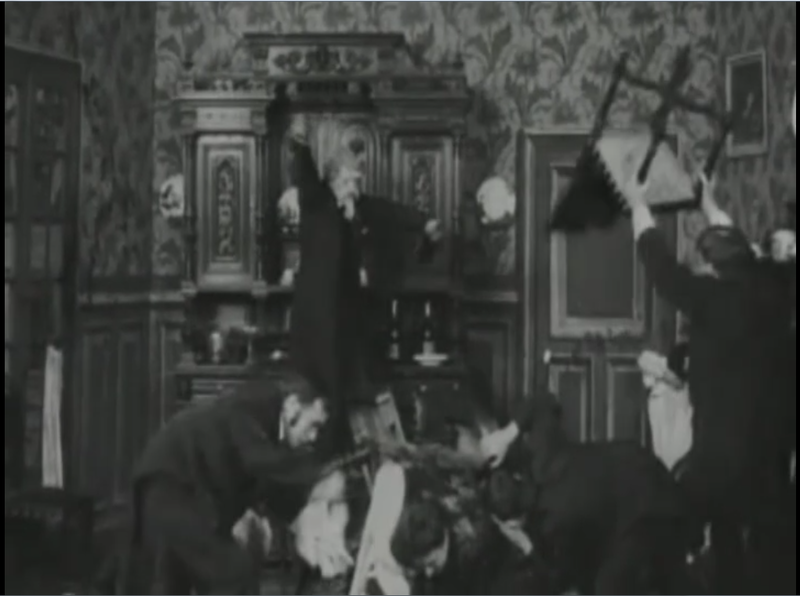 This early short by Louis Feuillade has something of the feeling of a Méliès comedy, although without the expected special effects. A middle class dinner party is disrupted when one of its members – a retired colonel – relates one of his war stories in an overly-animated manner. As his narrative proceeds, he begins acting out the campaign, overturning the table and attacking his fellow diners. Eventually he is subdued by a “devious counter-attack,” in which the entire party pummels him with discarded food from the floor. All action takes place in a single frame, occasionally interrupted by forward-facing intertitles and no editing or camera movement at all. It’s a fairly typical film of the period, not badly done, and it did get a few laughs out of me, but there’s nothing to suggest its director’s later genius.